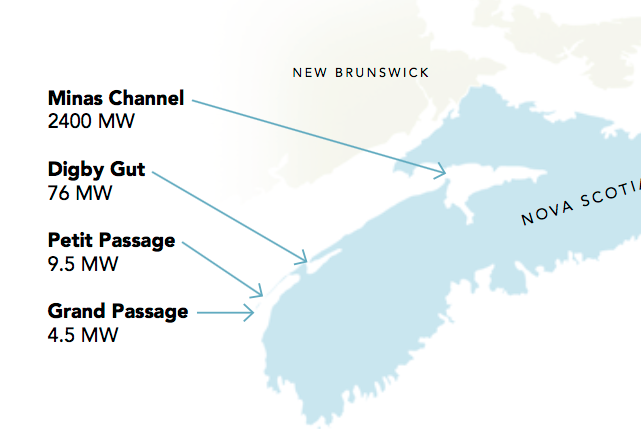 The Assembly of Nova Scotia Mi’kmaq chiefs say they feel increasingly frustrated that tidal projects appear to be going ahead in the Minas Passage near Parrsboro, N.S. in spite of their economic and environmental concerns. In a news release issued on Wednesday, the chiefs call on the provincial government to address their concerns about a range of issues including the potential effects of tidal turbines on fish, fish habitat and fish migration; the potential effects on sea mammals and the displacement of Mi’kmaq fishing. The chiefs say they’re also concerned that traditional ecological knowledge is not being included in assessing the potential effects of installing big tidal turbines at the testing site in the Minas Passage as well as smaller ones in Digby Gut, Petit Passage and Grand Passage. The Mi’kmaq chiefs say they want to meet with provincial environment and energy ministers to discuss their concerns. Last June, Environment Minister Margaret Miller approved the installation of two, 1,000 tonne, 2MW turbines in the Minas Passage as a way of gauging their effects. “If we are to advance our collective knowledge of the turbines’ impact on our fish and marine mammals, demonstration turbines need to be in the water,” she was quoted as saying. The two turbines in question are owned by Cape Sharp Tidal Inc., a partnership between the Irish/French company OpenHydro and Emera Inc., parent company of Nova Scotia Power. According to Cape Sharp Tidal spokeswoman Sarah Dawson, the first of the turbines is still in the harbour at Saint John, N.B. awaiting repairs to fastening components that were found to be defective. The company has applied for federal permission to use a foreign-owned, heavy-lift vessel to help with those repairs. The second turbine’s fasteners have already been repaired in Pictou, N.S. where both of the five-storey high tidal machines were assembled. Meantime, the Bay of Fundy Inshore Fisherman’s Association has launched two sets of legal challenges in their attempt to block installation of the turbines. On October 20th, a Nova Scotia Supreme Court judge will hear the fishermen’s application to stop any turbine deployments this fall. Then in February, the association plans to challenge the environment minister’s decision to OK the first two turbines. The fishermen argue that the minister should not have authorized deployment until baseline scientific studies are conducted to measure the presence of sea life including fish, marine mammals and lobster at the turbine testing sites. The association says such studies would take at least a year. This entry was posted in Tidal Power and tagged Bay of Fundy Inshore Fisherman's Association, Cape Sharp Tidal, Margaret Miller, Mi'kmaq chiefs, Sarah Dawson. Bookmark the permalink. Well….this is one situation to watch carefully! Please keep it in the public light! This whole turbine project has been massively mishandled from the start. Now we are seeing how the government of Nova Scotia under the non-leadership of Stephen MacNeil and his incompetent ministers have thought that they could sneak this monolith idea and project in under everybody’s nose while thinking that they and the locals would all be laughing on the way to the bank as the electrons flow out of the waters near Cape Sharp. Complicit in all this is the enterprise who are attempting to implement this nightmare. How much money has been squandered on this rube goldberg of a project? Now with respect to the parties on the other side…namely the First Nations people and the fishermen of the Fundy areas…Firstly…if you are going to do stuff either on the shores of Fundy or in the waters of Fundy that has not already been done in history..then ask the people who it MIGHT effect…fishers and First Nations! How bloody naive can these project people and regulators be? I can only guess that their heads must have been somewhere that light does not shine! These fishermen run their lives on fishing…they must have a say and play a part in this…it is their entire life and livelihood that may be affected by this “thing”. Secondly, the First Nations people have been treated unfairly by Canada and the Province for decades and it is time to ante up to them. They were here first and have not received a fair shake and that is a historical fact. Their heritage is around nature and its gifts to us who inhabit this planet. Why would anyone think of proceeding with such a ginormous thing as this is without having them deeply involved in the process? Their concerns are not as objections but are for the value of nature as it exists and how to best use the gifts that nature has bestowed. Hey…look what our government has accomplished just in the last couple of years regarding our most valued First Nations people here in Nova Scotia!!! Water on the Potlotek First Nation just near Port Hawksbury that is so polluted coming out of the water facility there that it cannot even be used to wash in and if boiled is more toxic than a chemical bath!!! Come on Stephen MacNeil…do something more than a couple truck loads of water bottles! Then there is the Shubinacdie River and the First Nation at Indian Brook who have fished the river and revered the eagles that nest on it’s banks for decades….well how did some natural gas outfit get government approval to store natural gas in salt caverns along the river and then when used the cavern salt will be flushed into the Shubinacadie River!!! What friggin Einstein came up with this? Not in all history can such a greedy plan by a company not directly affect the river in a most negative and possibly catastrophic way! Where is Stephen MacNeil….who knows! What is going on here and with First Nations having the same issue in New Brunswick near Fredericton is a crime against nature and its people in the name of profits, not progress. Look when it is fouled or spoiled forever, be it the Bay of Fundy or the Shubinacdie River it is gone and it is time that those whose futures depend on these things have a say in what is going on! Seems the only way these folks have to get heard is to slow traffic so some folks will recognize that “this just is not right!” Additionally these people have been held back economically for years and do not have the financial resources to oppose these things in courts.